How do you make a fantastic episode of Thriller? Start with a smart script that combines horror with a little dark humor (Robert Arthur, a Thriller and Alfred Hitchcock Presents regular, fits the bill quite nicely). Hire a veteran TV director to steer the ship (Herschel Daugherty is hard to beat). Then cast Boris Karloff three times in one episode and watch the sparks fly. Dialogues With Death is a joy from start to finish. Karloff introduces and end the episode. In between be plays two colorful characters in with vignettes about death. In the first he is Pop Jenkins who likes to sit in the morgue and chat with the dead. He usually keeps their secrets until, one day, he accidentally spills the beans. The rest of the story focuses on the consequences of his actions. 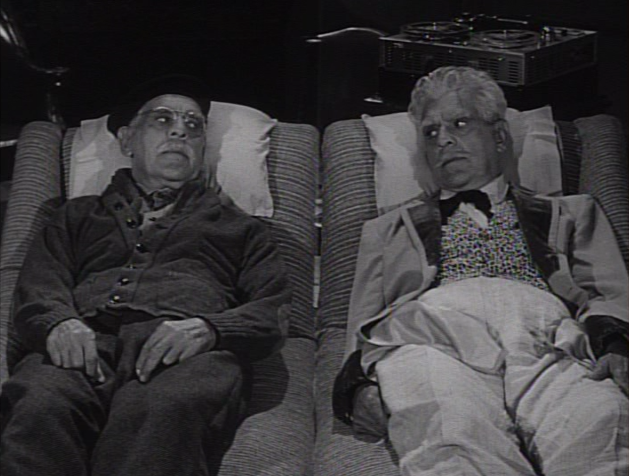 The second vignette contains Karloff as Col. Jackson Beauregard Finchess, an eccentric old Southern plantation owner. He is over the top great with this role and his performance is enhanced by Estelle Winwood [Batman, the TV Series] who plays his equally crazy wife. I love seeing Karloff tackling a comedic role. He is so good at it, it makes me wonder why he was not hired to do more of it! Episodes like Dialogues With Death are a reminder of how brilliant this TV series was. Thriller is definitely the best of the best in terms of horror TV. I haven't seen a Thriller episode in years but I remember it being a very classy horror anthology series. Boris Karloff also hosted another horror anthology in 1958 called "The Veil". It was never broadcast but you can see the entire series on DVD. Its also top notch.